This Gerber knife features the company's patented Gator Grip handle, which combines a glass filled nylon inner core with a Santoprene rubber outer for maximum durability and comfort. The soft, textured rubber provides an extremely secure grip to keep the knife in your hand during high-intensity tasks. Molded finger grooves and a lanyard hole improve retention even further. The high-quality stainless steel blade's drop point shape gives it both a sharp piercing point and a long cutting belly, and the plain edge is razor sharp to make slicing effortless. 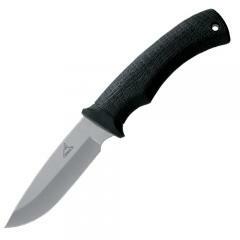 It comes with a ballistic nylon and molded plastic sheath for convenient, protected carry.